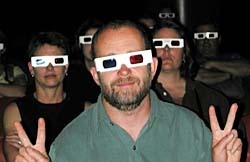 A peaceful experience for all of the audience at the New Light on Paper lecture May 25, 2001. The lecture was presented in the Gould Auditorium at the University of Utah J. Willard Marriott Library as part of the Paper Interiors exhibit. The presentation and exhibit was sponsored by the Book Arts Program. The speakers were Gene Valentine and CJ Kazilek.